Microsoft has gotten serious about display quality since the Surface 3 launched – and not the Surface Pro 3, but smaller, cheaper Surface 3. That was when they started to individually calibrate all displays on all devices, and the difference was dramatic. The average grayscale error level on the Surface Pro 3 was 6.4, with the display shifted to blue fairly dramatically, but the Surface 3 was 2.49. Since then, the company has refined their calibration, and at this point they are the only PC maker other than Apple to calibrate the displays on every product in their lineup. 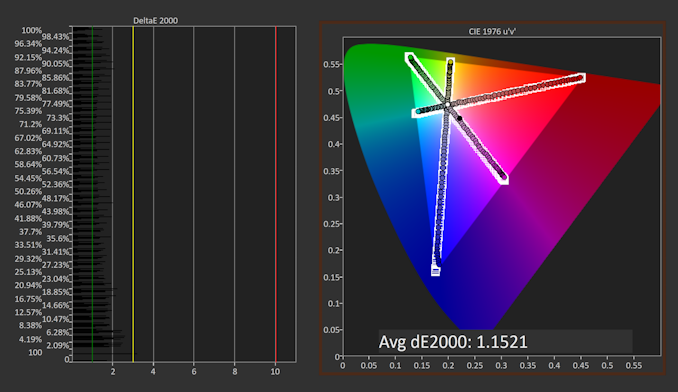 As such, Surface devices tend to have excellent color reproduction. But a display isn’t just about accuracy. You also need a resolution that is high enough that you can’t really make out the individual pixels, and Microsoft has kept the same 267 pixels per inch with their 2736x1824 12.3-inch panel as the previous two generations. For most people, that’s high enough where going higher would just impact battery life for no reason. 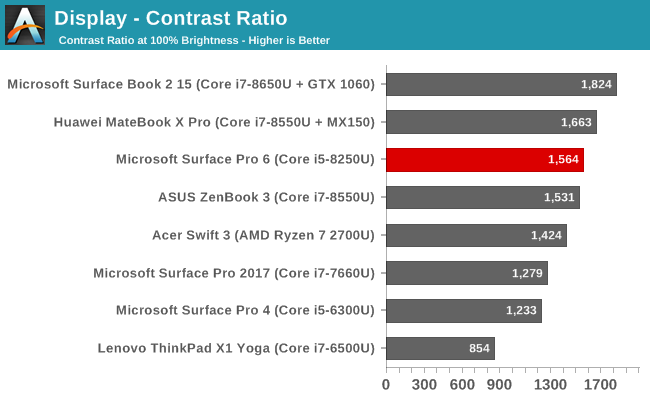 Another key feature is contrast ratio, and here the Surface Pro series was lagging somewhat compared to the best in the industry, which includes the Surface Book which offers exceptional contrast. We’ll test that with the 2018 model and see if it’s improved. So the skin tones are unaffected but other colors are made more vivid. 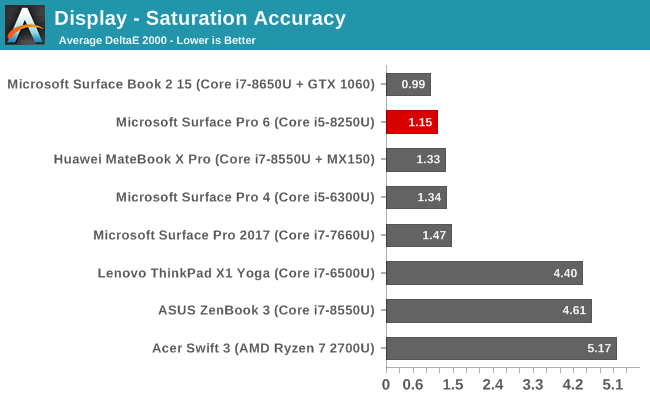 Although the Surface Pro series is generally incredibly accurate, running in a pure sRGB mode can feel a bit dull to some customers, so those customers can leverage the enhanced mode for a less accurate, but more punchy color scheme. 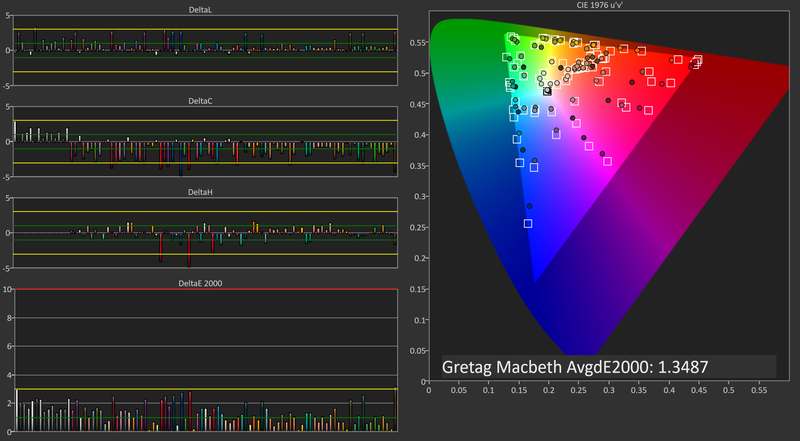 Those that need or want sRGB can have it with the tap of a button. It’s a good compromise since they’ve stuck with the sRGB panel again this year. Microsoft wants to showcase their platform with Surface, and on a device like Surface Studio they’ve done that, offering sRGB, P3 D65, and DCI-P3 gamut support, but with the move to HDR as well as wider color gamuts, it was disappointing to not see any of the Surface lineup offer HDR support. Perhaps the Surface Pro isn’t the right vehicle for this though, due to the power requirements of HDR impacting battery life, but if Microsoft is going to continue to push technology in the Surface series, it’s something we should be expecting soon. To test the Surface Pro 6 display, we use SpectraCal’s CalMAN software suite, along with an X-Rite i1Display Pro colorimeter for brightness and contrast readings, and the X-Rite i1Pro 2 spectrophotometer for color accuracy testing. 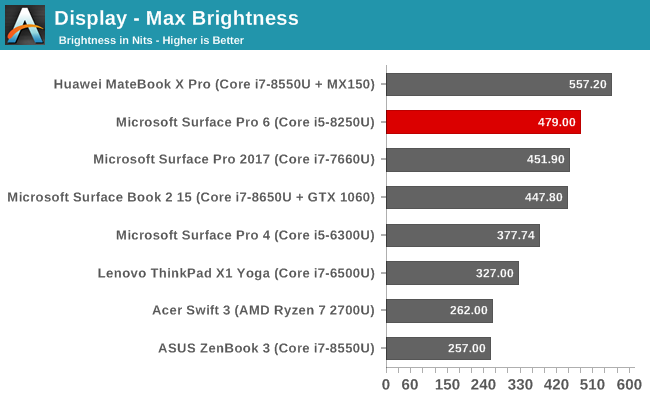 The Surface Pro 6 does improve overall peak brightness somewhat compared to the previous model, but the big improvement is the black level, which is significantly better on the latest Surface Pro, bumping the contrast ratio up to over 1500:1. The difference may not seem like a lot compared to the outgoing model, but the improved contrast was immediately noticeable when powering on the new device. This was probably achieved by using better aligned panels in the new display. It still can’t quite match the Surface Book 2, but it’s much closer. Mininum brightness is 5 nits. Every review unit is always going to be a bit of a lottery, although hardware calibration at the factory will fix most of the display issues. 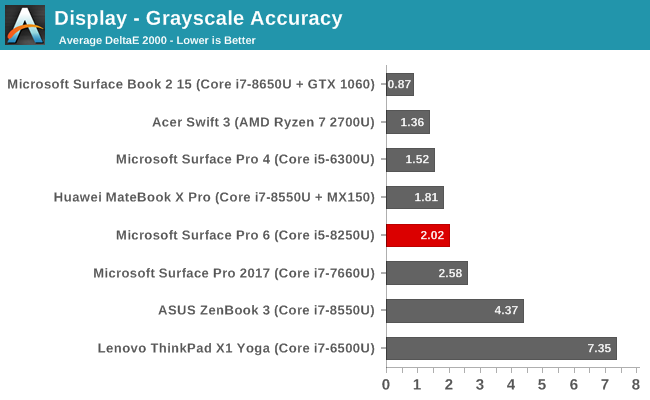 The grayscale accuracy of the Surface Book 2 we reviewed earlier this year was a stunning 0.87, but the new Pro 6 can’t quite match that, although with a dE2000 well under 3 across most of the range, it would still be considered one of the most accurate displays around. Gamma isn’t exactly at the 2.2 expected though, and the blue levels do drop off a bit as you close in on 100% brightness. The gamut test checks the 100% levels for all of the primary colors (red, green, and blue) as well as the secondary colors (cyan, magenta, and yellow) and as usual a lower error level means that the display is closer to what it is supposed to be displaying. 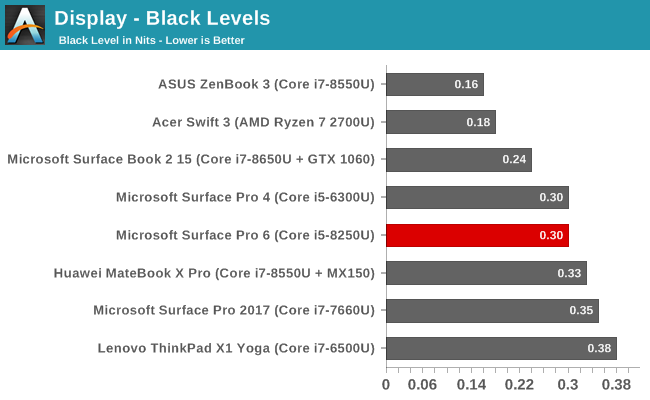 The Surface Pro 6 comes in with a stellar 1.19 average error level, which is practically imperceptible. At 100% blue, the blue levels are a bit lower than they should be, which is something we saw in the grayscale as well. Our saturation sweep tests 4-bit steps across the entire range of primary and secondary colors, and other than the 100% blue levels we had already seen in the other tests, the saturation is almost perfect with an average error level just over 1.0. The Gretag Macbeth colorchecker tests not only the primary and secondary colors, but also a wide range other points including the important skin tones. None of the tested colors showed an error level over 3.0, which is excellent, and the overall average error level was just 1.35. This relative colorchecker shows you the Surface Pro 6 displayed colors on the top, compared to the expected colors on the bottom, and as you can see the display is more or less perfect. We often harp on the power of individually calibrating displays, and this Surface Pro 6 review model is an ideal candidate to discuss why. 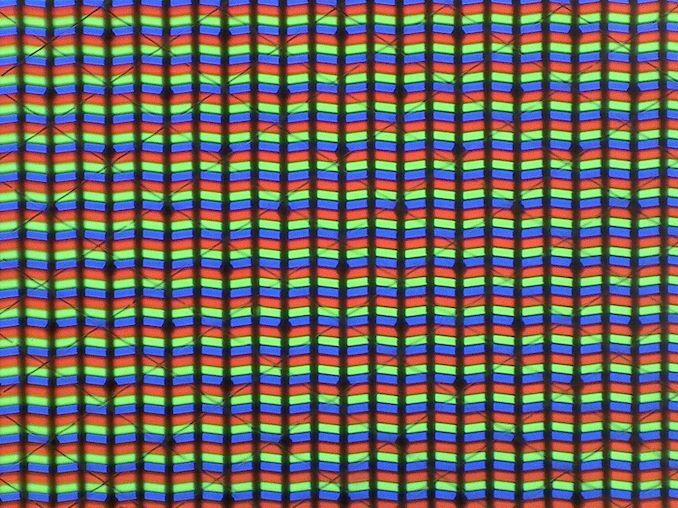 Here we have a display that shows more or less ideal reproduction of almost all colors, but the display can’t quite hit the full 100% level for sRGB blue. Rather than using an icc profile to correct this, which would likely cause crushing and banding, the entire range of blue is corrected to the best it can be, but 100% blue and just under is a bit off. 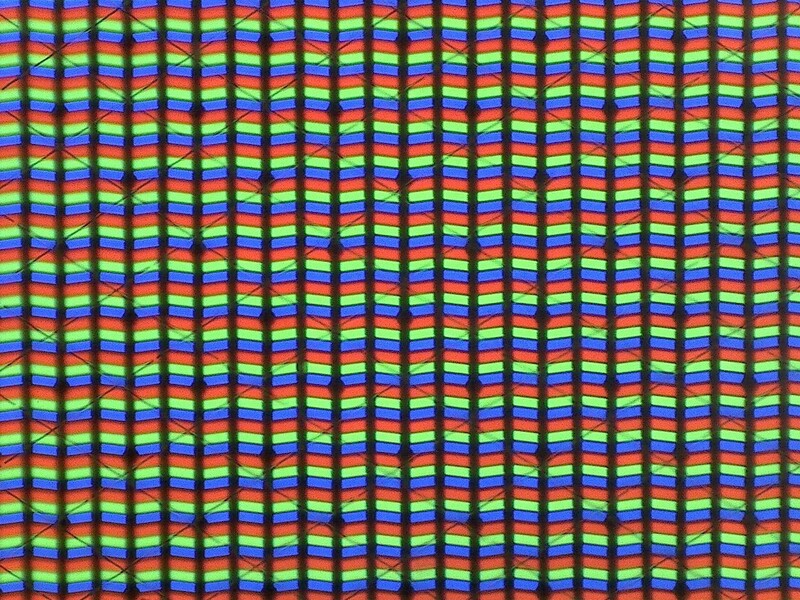 You can’t use calibration to make a display show more color gamut than it’s capable of, and this Surface Pro 6 unit can’t quite hit 100% blue, but thanks to the calibration, that deficiency is almost imperceptible to the eye. It would be nice to see Microsoft embrace HDR on Surface Pro in a future model, but the power costs would be high enough that the drop in battery life would likely be disliked by many of their customers. Overall, as we’ve come to expect with all Surface devices, the display on the Surface Pro 6 is one of the best around, with accurate colors, high resolution, and now, even better contrast. For all the talk of a lack of innovation from Intel, the charts comparing the various generations are quite incredible. 60% improvement in single threaded, 175% in multi, combined with a 100% improvement in battery life. You're just wrong here. Apple definitely sells more than Microsoft (Lenovo is around the level of Apple with HP and Dell far outstrip the rest). But the different isn't huge. There's no world in which "Surface sell in incredibly small numbers" compared to any other manufacturer's line. I don’t know what conferences you go to, other than those for IT, but I’ve never seen one of these anywhere. Except that speed increase comes from lower power usage. At the same clocks, intels chips are still not any faster then 3 years ago. 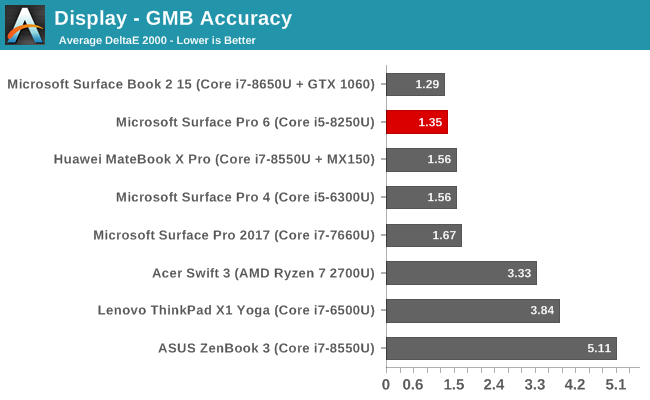 Looking at this sort of improvement misses the reason for concern with Intel. The original CPU (i3-4020Y) is 1.5 GHz, no turbo. The end point CPU (i7-7660U) is 2.5GHz base, turbo to 4GHz. Now from one point of view, it's nice that Intel has managed to boost frequency this way while not moving too far outside the power envelope. That helps low power devices (like Surface!) AND it helps large core count server chips. BUT look at the larger story. It's about lower power, NOT about higher achievable frequencies. The tech that got this does not help that much in boosting the frequency of your 120W desktop CPU in single-threaded mode. Meanwhile, there's been very little improvement in IPC, which can improve performance at the high end. The original was a i5-3317U dual-core hyperthreaded 1.7Ghz -> 2.6Ghz turbo. I have one. It's still quite nice, although with the cooling it has it can only maintain ~1.9Ghz under full load with BOINC. What is the downside of using a U-class CPU without active cooling? 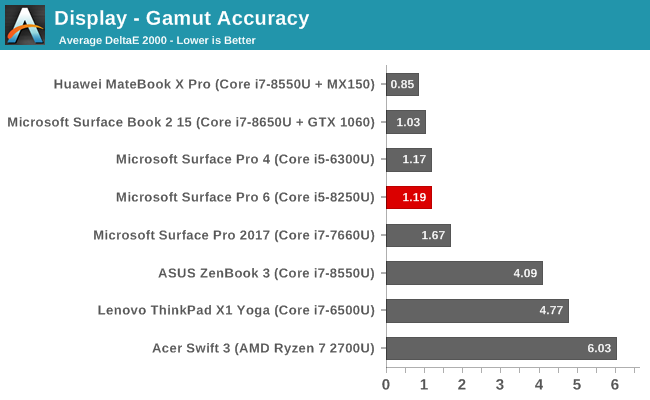 Surface Pro i5 is not the only one. Huawei's Matebook also pairs U-class 15Watt chips without fans.